Most people, when they hear the words ‘hearing aids’, picture a bulky, unattractive device that occasionally projects a high pitch whistle for all to hear. Hearing aid technology has come a long way since then, with three main types of hearing aid technology that help those who suffer with a hearing loss to live their life to the full. Rechargeable aids are most suitable for those who suffer with mild to severe levels of hearing loss. Their ground-breaking technology is designed to give you the freedom to live your life as you want, with their fast-charging and long-lasting batteries. Say goodbye to conventional batteries and enjoy effortless listening with automatic sound adaption. Rechargeable batteries mean you won’t ever have to worry about the hassle of replacing a battery in your hearing aids again. For many models, a single 3 hour charge can provide up to 24 hours of use, or if you’re in a rush, a simple 30 minute charge can give up to 6 hours of usage time. They are also environmentally friendly, with hearing aid wearers typically going through 100 batteries per year in a standard aid – helping to dramatically reduce wastage. Some aids even come with a powerpack, allowing you to charge up the pack before you go out and not having to worry about running out of power, wherever you are. Staying connected is important to those who suffer with a hearing impairment and Oticon offer incredible hearing aid technology with Oticon Opn aids. They were created to work alongside modern connective devices, allowing you to wirelessly link your aids to a tablet, smartphone, radio, TV or laptop – acting as a high quality set of headphones. This wireless connectivity can stream music or even phone calls direct to your hearing aid, with no need for a separate streamer. 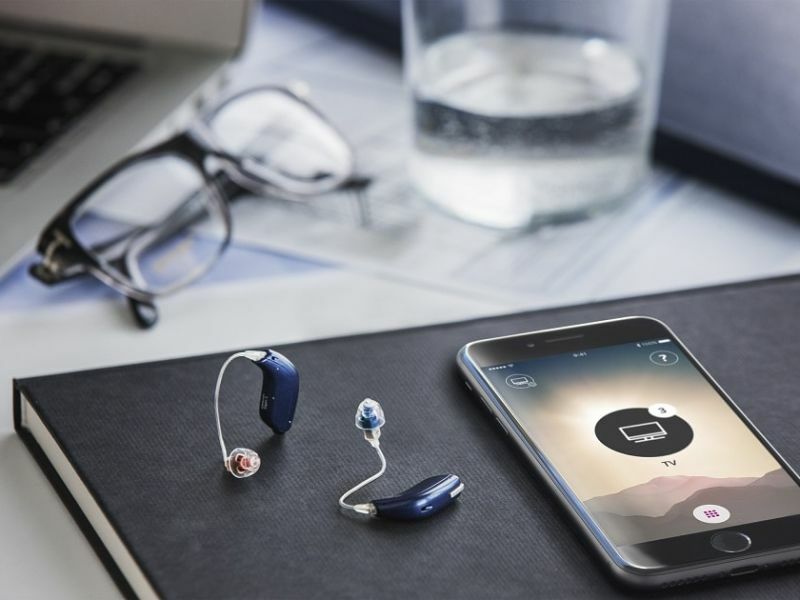 Oticon Opn hearing aids also have the Oticon ON app that connects to your aids, enabling you to adjust the volume, check the battery level and switch programmes – all via your smartphone. Their added features also include a ‘find my hearing aids’ tool and a built-in tinnitus relief setting. In addition to this, Oticon Opn hearing aids also work with the Internet of Things via IFTTT (If This Then That), which is an internet-based service allowing you to set linked actions for certain things you do, using your aids. For example, you can set it so that you receive a notification via your hearing aid when the doorbell rings, or you can even control lighting, appliances and virtually any other home device with an internet connection. Hearing aids are something of a dreaded thought for most, with one of the main reasons being because of the way they look, but with technology advancements the digital hearing aids of today are smaller and sleeker than ever. They are no longer uncomfortable and awkwardly designed, standing out like a sore thumb. There are now discreet invisible-in-canal (IIC) hearing aids that really are practically invisible. They are custom-made to fit perfectly in your ear, helping to make them so comfortable that you will barely know they are there. Invisible aids are increasingly available for more severe levels of hearing loss, meaning more people than ever can enjoy the freedom of discreet and state of the art hearing aid technology. These advancements in hearing technology have all been designed to make your life easier and help you live your life to the full - which is exactly why Leightons are dedicated to providing the best in the industry when it comes to hearing care and its technology. Our expert audiologists will be able to advise you on the best options available for you in terms of hearing aids and care. If you aren’t a hearing aid wearer but you’re concerned about your hearing, book a free hearing test online today with your local branch or call us on 0800 40 20 20.